BANGKOK, THAILAND – Leading Asian restaurant operator Mango Tree Worldwide has unveiled its second flagship dining destination in China with the opening of Mango Tree Guangzhou, located in one of the world’s tallest buildings. Bright, stylish and spacious, with panoramic windows overlooking the soaring city skyline, the new Mango Tree Guangzhou will elevate contemporary Thai cuisine to new levels of excellence in the destination through fresh, flavourful cuisine and fun dining experience. The high-rise, high-end restaurant is located within the K11 Art Mall, an international lifestyle complex and cultural hub on the seventh floor of the Guangzhou CTF Finance Centre. Soaring 530 metres in Guangzhou’s Tianhe District, this major landmark is taller than iconic Asian skyscrapers such as Taipei 101 and Kuala Lumpur’s Petronas Towers. “Mango Tree Guangzhou sets new global standards for Thai dining, with a menu that matches the restaurant’s spectacular setting,” commented Trevor MacKenzie, Mango Tree’s Global Managing Director. “An amazing level of detail has gone into creating this dining space. World-class interior designer, Steve Leung, and luxury lighting specialist, Tino Kwan, have created an incredible visual spectacle that will delight diners. “Our dramatic outdoor terrace is a breath-taking destination, overlooking the Guangzhou cityscape. Combined with the exquisite cuisine created by our awardwinning Thai chef, Aphichat Traduangdee, we fully expect Mango Tree Guangzhou to become a new ‘must-visit’ dining experience in this cosmopolitan city,” Mr MacKenzie added. Mango Tree Guangzhou is able to seat 147 diners in the contemporary indoor restaurant and alfresco terrace. A series of elegant table arrangements are available for all occasions, from large family groups to intimate couples’ meals and corporate business functions. Several tables are positioned next to floor-to-ceiling windows,allowing diners to gaze out over the glittering city. The restaurant is illuminated by an artistic light installation, which features hundreds of individual bulbs suspended from the ceiling like stars in the night sky. 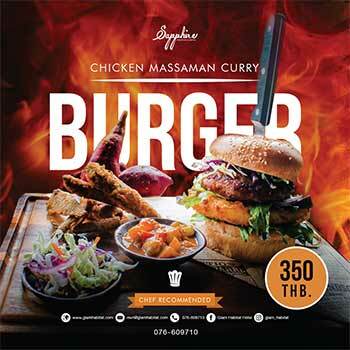 Chef Aphichat’s menu reflects his deep passion for Thai cuisine. Harnessing two decades of culinary experience, he uses high-quality ingredients to create authentic dishes, while also demonstrating his own style and flare with contemporary cooking techniques. Having worked at high-end restaurants and luxury hotels in Thailand and China, including The Westin Bund Center Shanghai, Sheraton Nanjing Kingsley and Lian Restaurant in Guangzhou, Chef Aphichat instinctively understands the Chinese appetite for Thai cuisine. He is now ready to delight diners at Mango Tree Guangzhou, which is expected to become popular among local and international professionals, upmarket local residents, high-spending tourists and more. The restaurant will be open for lunch and dinner. Mango Tree Guangzhou will become the company’s second restaurant in China, joining the existing Mango Tree Qingdao. In total, Mango Tree Worldwide now operates a total of 64 outlets worldwide.